Unifor faces one more hurdle before it can wrap up this round of labour talks with the Detroit Three: Persuading its members to ratify a tentative deal with Ford Motor Co.
Ford reached a tentative labor agreement with Unifor early Tuesday. it that includes $700 million in investment commitments at the automaker’s Canadian facilities. It includes a commitment for a “major engine program” at the Essex engine plant in Windsor, Ont., fulfilling a key goal for the union, which has sought investments from each of the Detroit Three automakers. It remains unclear if the tentative agreement will be ratified. Workers are scheduled to vote on the contract Saturday and Sunday. At issue is whether workers at the Oakville, Ont., assembly plant will sign on to the deal. Local union leadership at the plant, which employs about 5,000 hourly workers and constitutes the majority of Ford’s Canadian workforce, indicated last month that a deal modelled after the contracts with General Motors and Fiat Chrysler, such as the tentative Ford deal, would not pass at the plant. In order to appease members, the union sought to secure several gains outside the pattern, including a reduction in the 10-year grow-in period for new hires, but was unsuccessful in doing so, said Bob Scott, chairman of the Oakville plant. While noting that there are several elements to the agreement that he dislikes, Scott said he expects the deal to be ratified because it is the best contract Ford has agreed to in years. “I believe that our members are going to be quite happy with what we have done,” Scott said. 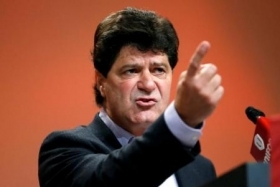 Unifor President Jerry Dias also expects the deal to be ratified. “It is ultimately our members’ decision, as it always is,” Dias said. The agreement was reached about a day after Unifor Local 200, which represents workers at Ford’s engine plants in Windsor, criticized the Oakville local’s bargaining committee on Facebook, calling their demands unfair to other Unifor members. “The implications of demanding more than the pattern agreement have been clearly laid out by Ford,” Local 200 said in the Facebook post, saying Ford would “reconsider their Canadian facilities and exit the operations” should a strike occur. The contracts with GM and FCA were ratified relatively easily, with at least 65 per cent support among Unifor members. Most of the deal’s investments will be in Windsor, where a new engine program will be implemented as soon as 2018. Dias said the engines will be featured on some of Ford’s top-selling vehicles, though he declined to discuss specifics. The deal also secures Ford’s Oakville plant’s international export footprint, he said. The plant, which builds the Ford Edge, Ford Flex, Lincoln MKX and Lincoln MKT crossovers, exports its vehicles to about 190 countries, the union said. However, the union said Ford plans to discontinue production of the Flex in 2020, even as the plant receives updates for refreshes of the Edge and MKX. The company confirmed the tentative agreement, but declined further comment. "To respect the ratification process, Ford of Canada will not discuss the specifics of the tentative agreement until unionized employees have had the opportunity to review and vote on the agreement," Ford said in a statement. Union leaders declined to discuss many of the deal’s details, saying it will disclose them to its members before it does so publicly. Ratification votes are set to begin on Saturday and conclude on Sunday. Unifor has repeatedly made securing product and investment commitments from the Detroit Three its top priority in negotiations. Combining the tentative Ford deal with the GM and FCA contracts, the automakers have committed hundreds of millions of dollars to their Canadian operations. Dias said the investment commitments represent a turning point in the history of the Canadian auto industry, which has been shedding jobs since the turn of the century in the wake of cheaper Mexican labor and an increasingly global marketplace. “I am hoping and expecting much brighter times for the industry here in Canada,” Dias said. The deal is patterned off the agreements with GM and FCA. Under those agreements, workers will receive a $6,000 signing bonus, legacy workers will receive a four-per-cent raise over the life of the deal and new hires will get wage increases each year under the 10-year grow-in period, which remains in place. The deal was reached after Unifor said Ford expressed concerns over the changes to the 10-year grow-in period. Under the pattern, new hires receive pay raises each year as opposed to a three-year wage freeze under the previous contracts. Unifor said Ford expressed skepticism about the new grid due to the roughly 1,000 hourly workers it has hired at its Oakville assembly plant since 2014. Unifor could face some resistance to ratification from the 5,000 or so hourly workers at Oakville, which assembles four crossover models for Ford. Dave Thomas, president of Local 707 in Oakville, said last month that a deal based off the pattern established during negotiations with GM would fail to ratify in Oakville, saying his members were demanding more on wages and economics. Unifor Local 200, which represents workers at Ford’s engine plants in Windsor, criticized Local 707’s bargaining committee on Facebook this week, calling their demands unfair to other Unifor members. “It is ultimately our members’ decision, as it always is,” Dias said, adding that he expects the agreement to be ratified. Bob Scott, chairman of the Oakville plant, said the union was unsuccessful in securing certain gains that it sought, including a reduction in the 10-year wage grow-in period to eight years and preventing a change to pension plans to new hires. However, he expects the deal to pass, calling the deal the best agreement the union has received from Ford in years. Like under the GM and FCA deals, the agreement would place new Ford hires on a defined-contribution retirement plan, which are seen as less risky to the employer than a traditional pension plan. Details of the Ford plan were not immediately known, but the FCA and GM deals require new hires to contribute 4 percent of their earnings to the plan, which the companies will match. Dias said the Windsor engine plant will continue to build 6.8-litre engines V10 engines under the contract. While those engines are expected to be phased out over the next several years, Dias said he expects production to continue until the next round of negotiations in 2020. It was not immediately clear if Unifor was able to secure the jobs in place at the Windsor plant. Dias said there will be a “transition” for workers at the Windsor plant as the new engine program in Essex begins in 2018. He said he expected the total number of employees at the Windsor engine plants to grow as a result of the agreement. “The death of the Windsor plant that we were expecting for years, is it knocking on our doorstep? The answer is no,” Dias said. He said the investment commitments are not dependent upon government support, but he reiterated his call for the federal and Ontario provincial governments to collaborate with the union and automaker to make Canada an attractive place to invest via financial incentives.